One of the cloud’s great promise has been cost-reduction and for a while, we’ve chanted a mantra that startups require less capital than before to get started and ultimately succeed. As the number of publicly traded SaaS companies has grown with time, it’s possible today to examine whether those statements are proven in the data, at least for those 41 publicly traded companies. I’ve gathered the financing histories of the 41 publicly traded SaaS companies and adjusted them for inflation. 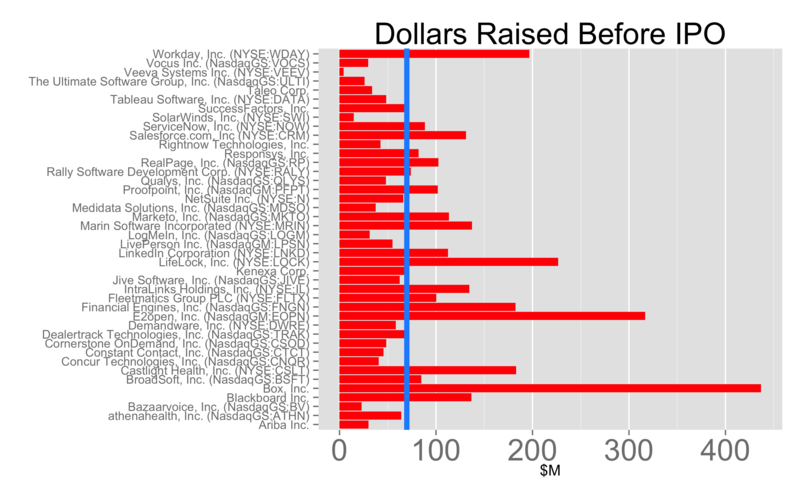 The chart above shows the amount of capital raised in millions of 2014 dollars by each publicly traded SaaS company before going public. Click on the image to see a bigger copy. The blue vertical line is the median across this data set, $70M. The median doesn’t tell the story because the variance across the different companies is enormous. At the top end of the range, Box has raised more than $400M. At the bottom end, Veeva raised only $4M - a 100x disparity. So it’s clear there isn’t just one way to build a hugely valuable SaaS company. There’s more to the story, however. The table below compares the financing patterns of SaaS companies over time, in cohorts of 4 years. The first row contains data from IPOs between 1998-2002, the second bucket contains data from IPOs between 2002-2006 and so on. These figures are inflation adjusted and are in 2014 dollars. The number of rounds of financing each company raises before IPO has nearly doubled from 2.5 to 4.5, i.e. Series B/C to Series D/E. These figures exclude seeds, which I’ve defined as rounds less than $1.5M. The total amount of cash raised before IPO has doubled from the ‘98 cohort, adjusted for inflation. The median round sizes across the life of the company have remained relatively constant. In other words, the typical round size for SaaS companies hasn’t changed materially over the past 16 years but the number of rounds has doubled, which has doubled the amount of capital a startup raises in aggregate before IPO. At least on the surface, the data indicates SaaS companies aren’t more efficient. That pattern may be driven by an increasingly friendly financing environment or because of increased capital needs of the business or many other reasons. So the next question to answer is capital efficiency. In a future analysis, I’ll calculate the ratio of revenue dollars to VC dollars invested to get a sense of the reality of cloud capital efficiency per revenue dollar.